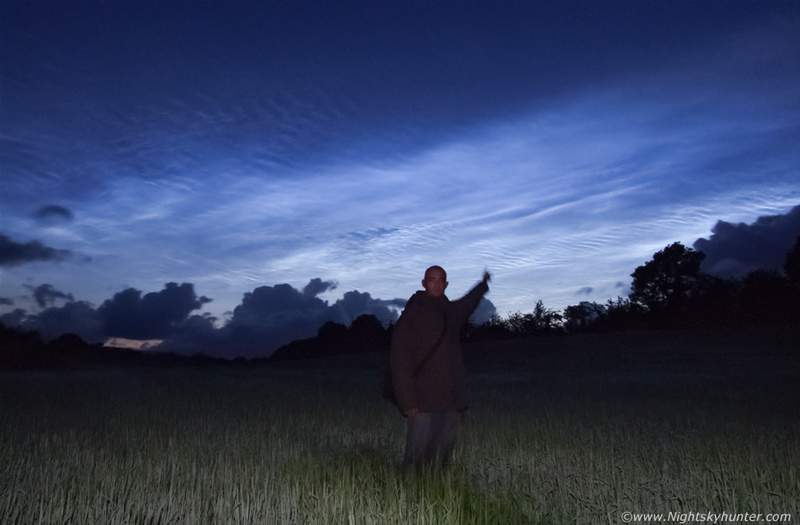 An unforgettable sight at midnight on July 12th 2009 standing in a dew-soaked field outside Maghera under a type 5 brightness all-sky NLC display which was casting shadows and illuminating the fields, their electric blue colour was also reflecting upon the cumulus clouds over the hills which were still bubbling up after a day of very active thunderstorm activity. This NLC display was visible overhead so I had to wait until it dropped into the NW/N sky before I could fit a section of it into my 24mm lens, the display boasted vivid bands and herringbone structure, this image was taken using my old Fujifilm S6500 bridge camera. * All images are available for sale in the form of photo prints, canvas or digital files for licensing, if you are interested in a purchase simply drop me an email.